Our Secondary Spill Containment Pallets and workstations are easy to load with the low profile design and optional ramp. 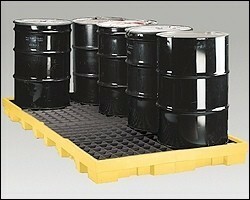 Usually drums can be loaded off a wooden pallet on to these containment pallets. There is no need to worry about incidental spills at you facility from drums in storage when you have them stored on our spill pallets. One piece construction optimizes space for increased durability, safety and efficiency. 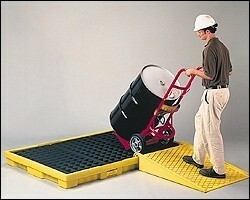 Ample sump capacity in each spill pallet. 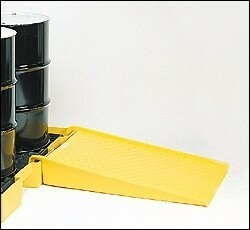 This secondary containment product is perfect for use as a dispensing station, for storage or as a work center. Each Secondary Spill Containment Pallet Workstation is designed for stand alone use or can be combined with other spill pallets for a customized work area. Tough polyethylene construction, cannot rust or corrode. These low-profile modular spill pallets actually become part of your factory floor, optimizing space for increased safety and efficiency. Makes drum loading a snap. Multi-purpose pallet ramp hooks onto any workstation for easy loading. Heavy-duty removable poly grates included for easy cleaning. These secondary spill containment pallets do not have drain plugs. 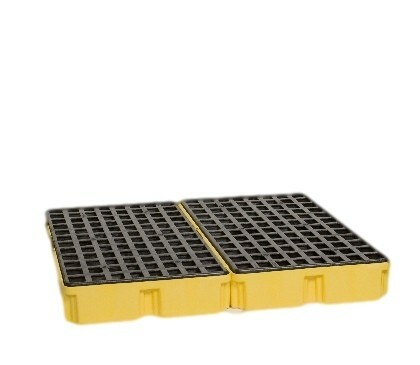 The 6.5" height of all of the spill pallets listed below allow for multiple options for a modular design. You can easily connect each pallet with the built in U-channel. When you purchase these pallets you have the flexibility to expand your drum storage needs in the future as needed. 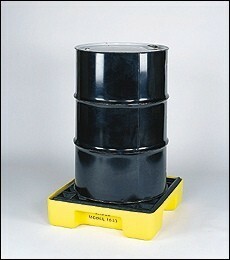 For chemical compatiblility see our High Density Polyethylene Chemical Resistance Guide. These products help you comply with regulation 40 CFR 264.175. 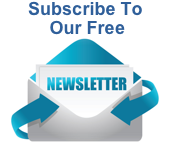 See the Federal Regulatory Compliance Summaries here. 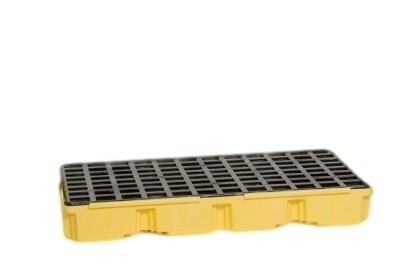 Flexible modular system so you can add spill pallets as your needs increase.